Dog bowls should be picked up and put away when your dog has eaten. This allows you to see exactly what any one dog has eaten, stops ants and the like from contaminating your dog's food, and prevents resource guarding. All dogs should be fed in separate areas completely, which allows them to enjoy a very important part of their day, in peace and quiet. Dog food should not be left outside, and dogs should eat two meals a day when adults, which will help to balance their serotonin levels. Why do dogs feel like eating has to be a race? We have no idea, but we solved the problem anyway. Featuring meal-lengthening ridges and mazes, Fun Feeders™ keep pups engaged for up to 10x longer at chow time, and is available in different designs. 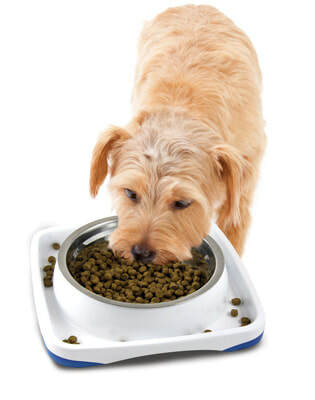 We also have a large range to suit any dog, from Spill Guard which additionally does not let the bowl tip, right through to non slip bowls, stainless steel plastic bowls, twin bowls, bowls perfect for travelling and Feeders for multiple meals. All our bowls are durable and made from high quality material. To view our whole range, do visit McMac Pet SA and also to find a supplier.